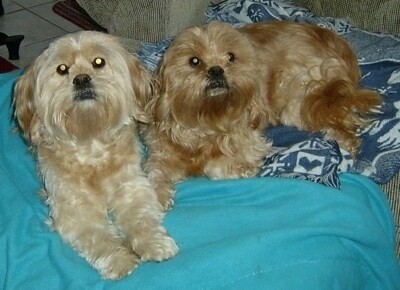 "Here are my two pups, Baby and Scout, English Toy Spaniel x Shih Tzu mixes. They are about 2 in this pic. Definitely hunters, they chase anything that moves. Scout is more mischievous than Baby. Baby would just prefer to sit on your lap. Baby and Scout are brothers from the same litter. They also have been together since they were born so they are never apart. They are sweet and lovely. 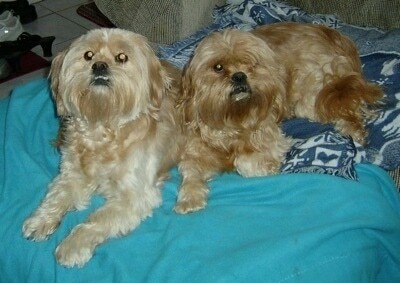 They need to be regularly groomed. Baby gets the watery eyes but Scout doesn't. Baby's hair grows longer and is full of curl. Scout's coat, which still grows long, is more coarse and straight. They love to play with stuffed toys, although Scout rips them to pieces in SECONDS! They will play tug-of-war with a pull toy. And of course LOVE bones and treats. The only thing unexpected is how big they grew. We were told they would be 10-14 lbs. at the most. And they are 22-25 lbs.! Almost double the size we expected." The Engatzu Spaniel is not a purebred dog. It is a cross between the English Toy Spaniel and the Shih Tzu. The best way to determine the temperament of a mixed breed is to look up all breeds in the cross and know you can get any combination of any of the characteristics found in either breed. Not all of these designer hybrid dogs being bred are 50% purebred to 50% purebred. It is very common for breeders to breed multi-generation crosses.